This review is of the cut shown at the BFI London Film Festival in October 2016 – the UK release date is currently listed for January 13th 2017. I can already feel the seething jealousy coming from any journalists that have stumbled onto this review (and if you are one of them, then a warm welcome to you). This is because not only is writer-director Damien Chazelle’s follow-up to the Oscar-winning Whiplash, the breath-taking musical La La Land, highly tipped for major awards success over the next couple of months, but it was also the hottest ticket for this year’s BFI London Film Festival, with each one of its screenings selling out within minutes of tickets going on sale (I was lucky enough to nab a seat the minute the booking process opened up, which probably goes to show how little a life I actually lead, but there we are). What’s more, the press screening that was held just hours before the screening I was lucky to get a ticket for, had a queue going from outside the doors of the Picturehouse Central right up to the edge of Leicester Square itself, with at least half the queuing patrons being turned away because of lack of space. Put simply, La La Land hasn’t even been released yet, and it’s already an absolute monster. And once you actually see the film, you’ll completely understand why. Chazelle’s film is simply extraordinary, something that is immediately obvious with an opening one-shot sequence of a chorus on the gridlocked Los Angeles freeway singing and dancing to one of the many original musical numbers by songwriter Justin Hurwitz. 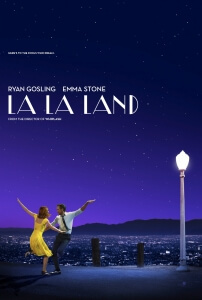 It immediately brings back the giddy vibe of the old-age Hollywood musicals while slyly updating it for the 21st century, and gives us a joyful representation of what we’ve got to look forward to; in this case, it’s a story of two individuals, struggling actress Mia (Emma Stone) and frustrated jazz pianist Sebastian (Ryan Gosling), whose paths end up crossing more than once and eventually to a romantic effect. However, their respective career paths – with Sebastian being courted for a band fronted by an old friend (John Legend), and Mia attending one horrific audition after another – threatens to throw a spanner in the works, and the film ends up being about these two very different people with two very similar dreams coming together and trying to make it work whilst at all times not giving up their goals and desires. In that sense, La La Land ends up being both an ode to classic movie musicals like Singin’ In The Rain and Anchors Aweigh, and also to people out there in all corners of the globe, not just in Hollywood, who never give up with pursuing their dreams and fantasies, doing what makes them happy as well as thousands of other people, and excelling at it. Chazelle clearly harbours a love for the joyful and un-cynical vibes that certain musicals can give – in fact, prior to Whiplash, his little-seen directorial debut Guy and Madeline on a Park Bench was a jazz musical – and brings that energy back to the big-screen after a pro-longed absence, while also giving it the update that the genre so desperately needed. At the same time, he also refuses to present a syrupy vision of the heightened reality this is all taking place in, and instead of the traditional happily ever after aspect there are some harsh truths which are explored to unexpected depths, both on an emotional and a spiritual level. This is a world where people may break into choreographed sing-and-dance numbers at any given moment, but also must face the reality that at the end of the day, not everything is going to end up exactly as they may have hoped. The film does a fantastic job at displaying that, as we see Mia being invited to auditions where casting directors aren’t even paying attention to her, and Sebastian essentially selling his soul in exchange for a position in what turns out to be a cynical and overproduced modern jazz band. In many ways, La La Land is perhaps the best representation of Hollywood itself in years, one that invites you in with its glitz and glamour but leaves you feeling uncomfortable by some of its harshness once you lift up the veil. Gosling and Stone, together on-screen once more after appearing aside one another in Crazy Stupid Love and Gangster Squad, continue to be a dynamic duo that deliberately harkens back to the days of Fred Astaire and Ginger Rogers, and honestly neither of them have been better than they are here. Stone, in particular, knocks it out of the park and right into the stratosphere, with a performance that only someone like her could accomplish; funny, charming, sweet, and all with a fantastic singing voice. Gosling, in contrast, struggles a little bit with the vocals, but as a dancer, a musician – apparently he learned how to play jazz piano especially for this movie, and with some of the stuff he has to do you’d swear he’s been doing it for years – and certainly as an actor, he’s incredibly watchable. Theirs is a romance that you can totally buy, and you’re definitely rooting for them to be together, even when reality is trying to tear them apart. Then, of course, there’s the music. The amount of toe-tapping original songs in this are too many to count, but if the filmmakers play their cards right, they could end up being as beloved and overplayed (for better or for worse; pick one) as the soundtrack to Frozen, though perhaps not as immediately catchy. Choreographer Mandy Moore – who I am informed ISN’T singer/actress Mandy Moore, although feel free to correct me if I’m wrong – has the on-screen performers tapping along to some extraordinary and often exhilarating moves, with no limits on the imagination (a late-night trip to the Griffith Observatory redefines the word “magic”) and all to cinematographer Linus Sandgren’s colourful and vibrant imagery. Most of all, however, Chazelle keeps everything going at a leisurely pace, ensuring that it is as seamless as it needs to be whilst at all times remembering to entertain the people who are watching it, and with every passing dance routine or song puts the emphasis on the characters and the story rather than the extravagance of the production itself. This is the reason why I love going to film festivals like this one, because sometimes it feels like I’m getting an exclusive look at the next big thing to come out of Hollywood. If its unusually popular presence at this year’s festival is any indication, not to mention its previous successes at Venice, Telluride and Toronto, then it’s incredibly likely that La La Land could indeed become that next big thing. As it happens, with its fantastic sentiment, awe-inspiring music and absolutely charming qualities from both its stars as well as the filmmakers, it deserves as big an audience as it can get. La La Land brings back the absent feel-good vibe from movie musicals and gives it a fresh update for a modern audience, and while the musical aspect is great it’s really the grounded nature of the story and its characters – marvellously played by Ryan Gosling and Emma Stone – that leave the strongest impression, making it an absolute triumph for writer-director Damien Chazelle.